A climber has spoken of his relief after surviving a terrifying plunge down a perilous mountain face in the Cairngorms. Rob McClymont was in a party of 34 enthusiasts from Barrow-in-Furness in Cumbria when he lost his footing and tumbled 60 feet on Corrie An Sneachda. 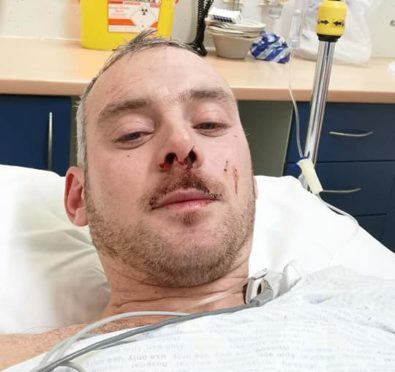 The group were on the mountains as Storm Deirdre battered the country and saw the 32-year-old – himself a rescue officer with Furness Coastguard – crash into a large rock beneath them. Fortunately, two instructors from the Glenmore Lodge activity centre also spotted his plight and called for help, before waiting with the stricken climber. His rescue was a gruelling one for the dedicated men and women of the Cairngorm Mountain Rescue Team. They struggled through treacherous conditions bearing Mr McClymont on a stretcher for over an hour before he could be airlifted to safety. Recovering in hospital, the climber said: “As I was coming down the mountain, I went to cut a ledge in the ice with my boot to make it easier to stand on but missed my footing and started to slide. “As I built up speed, the slide turned into a roll, and then the roll turned into a bounce. “I bounced 60 metres down the hill before smashing into a rock. “I hit my head, though luckily I was wearing a helmet, and just as luckily my rucksack took the brunt of the impact. “The rest of the party was still on the climb down and if it wasn’t for two instructors from Glenmore Lodge out climbing I’d have been on my own. “They called it in and raised the alarm, before checking me over. “At the time I was in a lot of pain, I couldn’t move my legs or my elbows or other joints, and as well as all the cuts and bruises they suspected an ankle fracture. “The Cairngorm Mountain Rescue Team carried me on a stretcher for half an hour to an area where the helicopter could safely land. “I was taken to the hospital in Inverness, where despite a lot of swelling it turned out I had no broken bones. “I’m so appreciative to everyone involved who helped me. A spokesman for Cairngorm Mountain Rescue Team (CMRT) said the rescue had been a tricky one, in poor conditions. He praised all those involved in the rescue, including the skilled crew of the rescue helicopter. The spokesman said: “CMRT were called out on Friday afternoon after a member of a climbing party fell some distance and sustained a leg injury. “Around twenty people undertook a slippery carry through the boulders, including team members and Glenmore Lodge instructors.